Here’s a downloadable Inspiration in the Ordinary PDF of the information above. Thanks again to all my visiting artists! 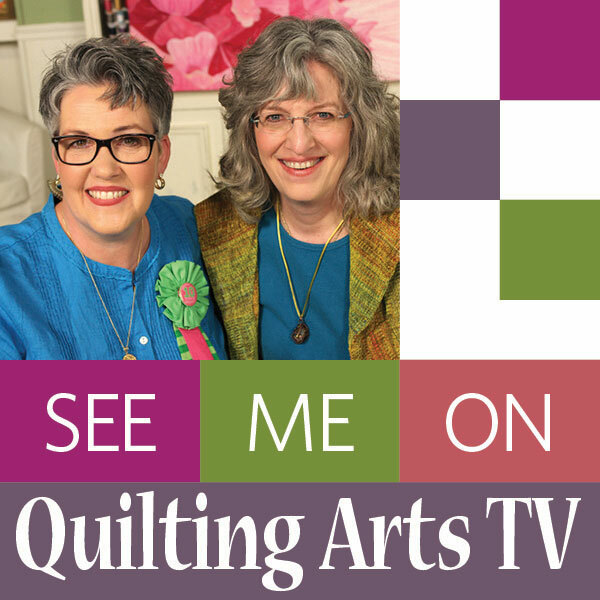 A blast from the past..almost three years ago at International Quilt Festival Houston, 2014, I was interviewed by the Save Our Stories project. I was able to record a little about making the portrait of our son Eli during Cross Country season 2013. The recording has finally been uploaded to the internet, so I thought I would share. This quilt will also be in the upcoming Rising Stars exhibit which will feature the work of two artists, me and Karlyn Bue Lorenz. 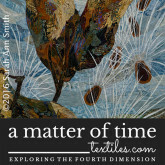 I hope you enjoy this visit, and even more I hope I will get to see some of you at my exhibit of 24 of my pieces. 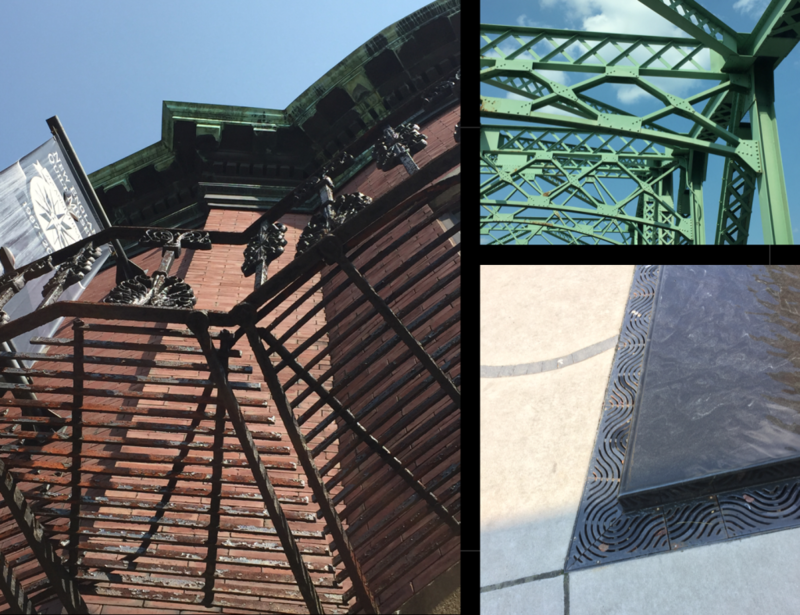 Retrospective book of my work–input sought! Hi folks! I am in the midst of preparing a book of my work including the 24 pieces that will be in my part of the Rising Stars exhibit this coming fall at International Quilt Market and International Quilt Festival Houston, as well as many of my other best pieces from the past decade and bits about my life and influences. If you have experience selling books from either Blurb or CreateSpace (an Amazon company) let me know. I am still undecided which platform to use. I would dearly love your input, whether you have self-published or as a consumer. Do I use Blurb? or Createspace? Where would you go to purchase… I’d have a link on my blog etc. 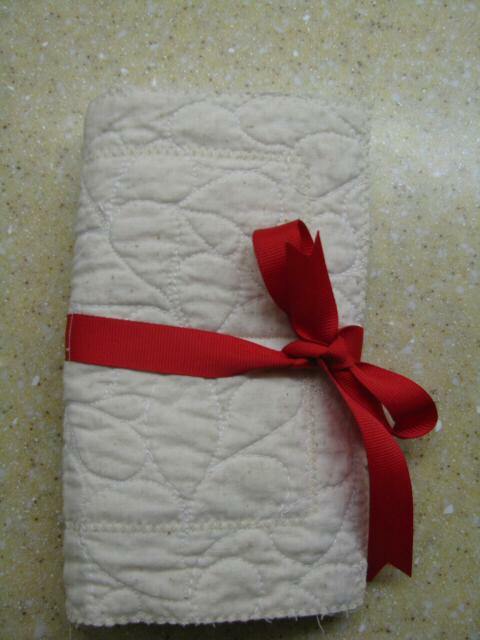 to either option so folks who don’t attend Quilt Festival may also purchase a copy. I feel the quality of the Premium Magazine at Blurb is definitely better than the book I can create through CreateSpace–I have copies of Blurb books, Blurb premium magazine (which you would never know is a “magazine” as it is exceptional quality–a teacher I know uses this for her books and it is excellent), and several books (exhibit catalogs) from CreateSpace. I really really want top quality over profits on this, but I also would like folks to be able to purchase the book easily online. With both platforms, I can select an 8 1/2 x 11 portrait format (vertical) so I can include large images with good detail shots. For print quality, Blurb Premium “Magazine” wins and the cost (unlike Blurb books) is reasonable. For customer ease and distribution, using Createspace on Amazon is better because Amazon takes a much lower percentage of the sales price is you use their platform. What to do? For international customers, absolutely the Amazon/CreateSpace option is better because it can be on-demand printed from European Amazon sites, thereby reducing postage costs. For those in the US, I can have it on my site and Amazon-or-Blurb, depending on my final decision. 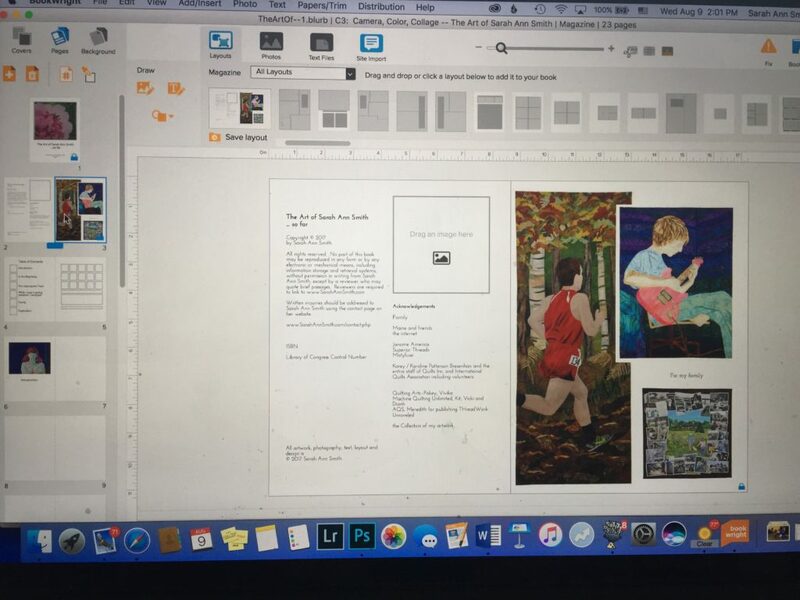 The Blurb “magazine” is better overall print and paper quality, the template software is superb, but even if I can manage to list it on Amazon, I would make almost nothing (less than a dollar probably) per copy to keep it in the affordable range. Please let me know your thoughts! Would you buy from Blurb? Or do you vastly prefer Amazon? Price would be $25-30 plus any shipping depending on final page count–I’m guesstimating 80 pages, but could be a bit more or a bit less. My goal is to keep the price under $30. 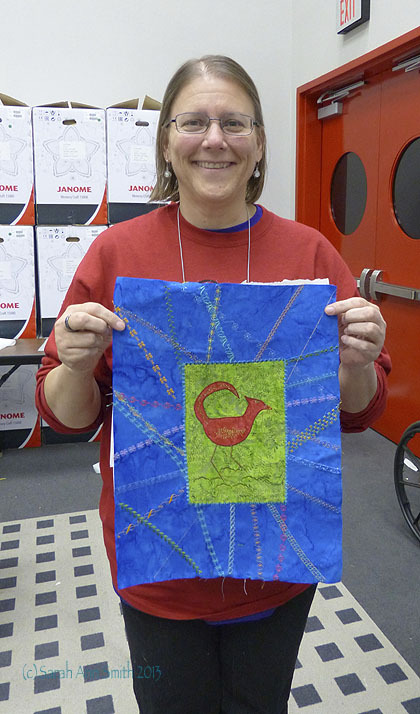 International Quilt Festival 2013, Houston, #6, Decorative Stitching! 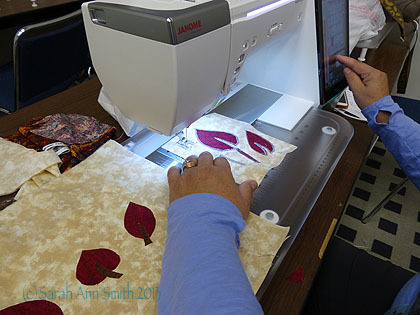 Time for another catch-up post, about my Decorative Stitch Applique class on Friday at Quilt Festival. I’m on a yahoo group for Janome 6600-7700-8900 owners, and a discussion cropped up about using the decorative stitches and I realized I had yet to post this information, so here goes! 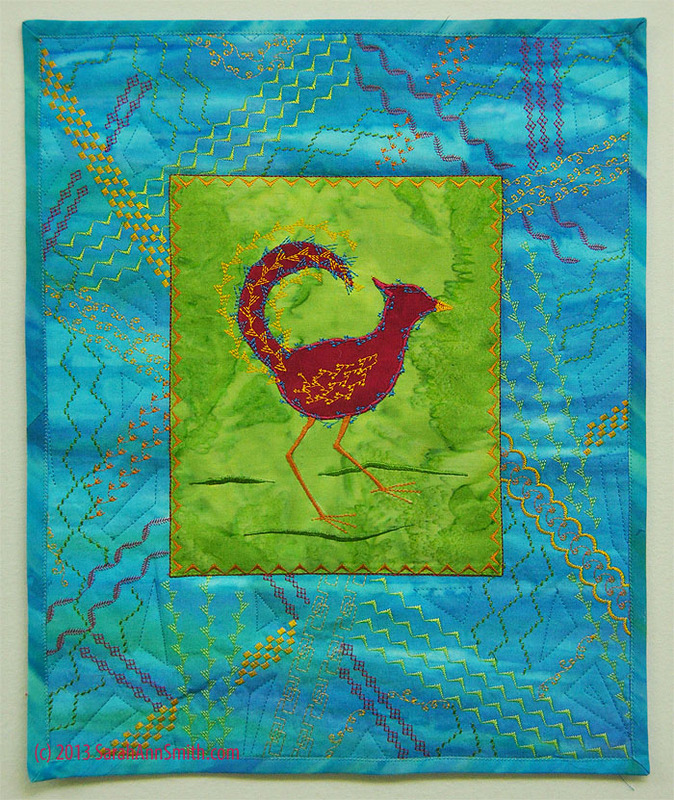 The Funky Chicken, from Sarah’s Decorative Stitch Applique class in Houston. Right click to enlarge image. I’ve stacked (grouped) stitches on this one. For example, the checkerboard (in yellow upper left) is two passes of a satin stitch that has two columns of small alternating squares. To the lower right of the green square, a scroll stitch is bracketed with scallops. 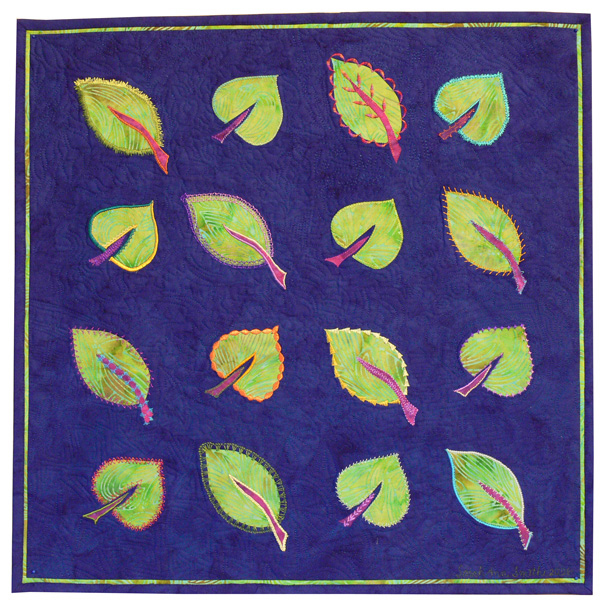 The center square is appliqued, stitched with the “V” stapes, then outlined with a bold straight stitch. Done on a Janome 8900. 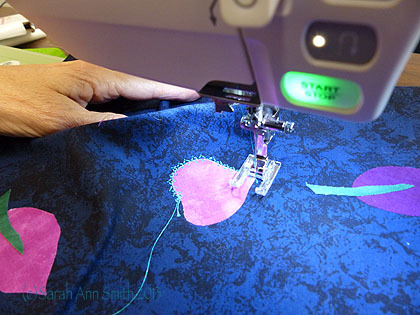 Ya know how we all have these fancy machines that do a bazillion things, and pretty much 98 percent of the time (or more) all we do is use the straight stitch and sometimes the zigzag? Well, when I wrote my book, Threadwork Unraveled, I included a section to teach folks how to play with their fancy stitches. This is the project in the book and the regular class project. Decorative Stitch sampler for my Decorative Stitch Class. This student used the same colors as my sample. 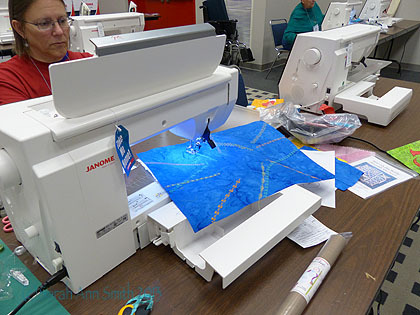 We were luckily in the Janome classroom with the FABULOUS 15000 machines. I’ve never been a fan of computer-screen sewing machine models, as I prefer visual knobs and buttons. Well, let me tell that has changed! I have severe sewing machine lust for one of these babies! And they have even more (!!!) stitches than the already fabulous 8900! 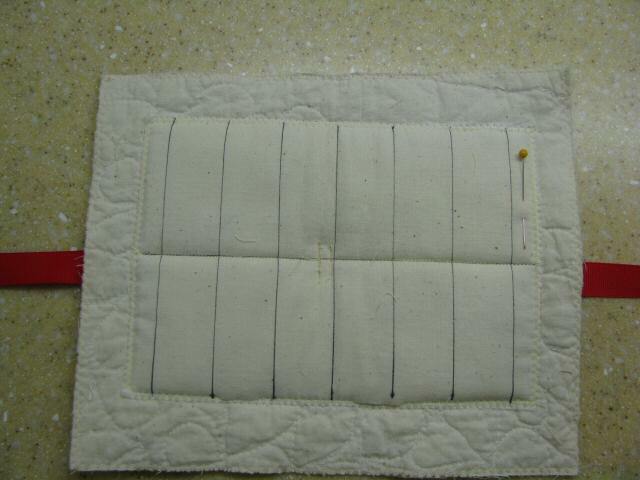 A student is making sample blocks with decorative stitches. 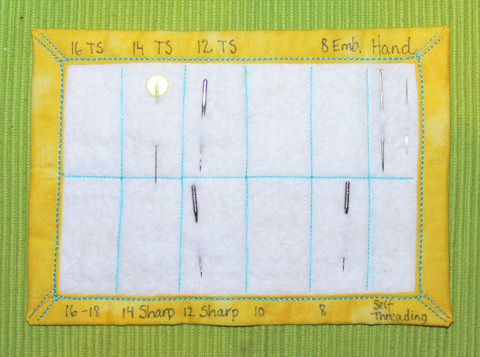 This is a great way to test out pattern combinations–here she has a practice square to toss out and her “real” piece on the left. 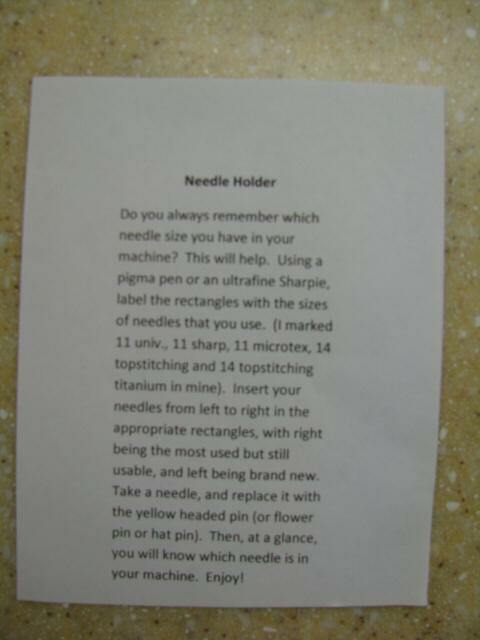 If you have a practice square, that means you don’t have to pick out the stitches if you don’t like them! 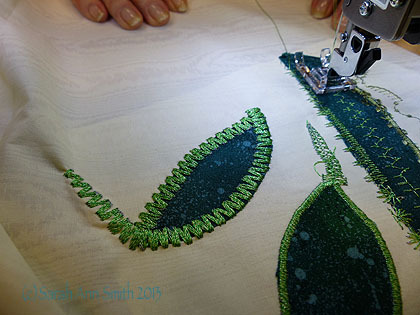 Close up of decorative stitching on an aspen leaf. This student tried a very bold, wide multi-stitch zigzag. You can see this is her practice bit–see how she has tested the appearance of various stitches in the strip on the right? 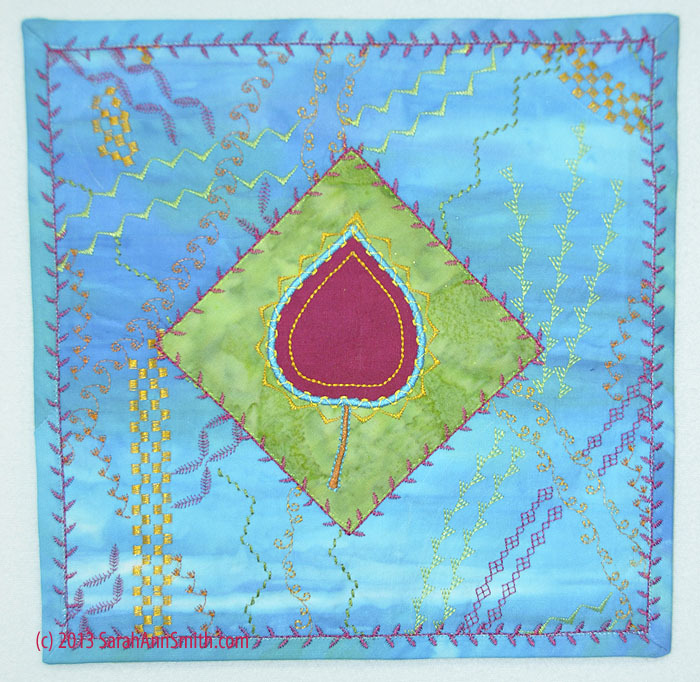 I made a smaller (about 9 inches square) quiltlet with the sampler leaf and the background stitching. If you right click on this image, you can see more detail. Notice how I layered up stitches to applique the green patch and how I used a decorative stitch on the binding. 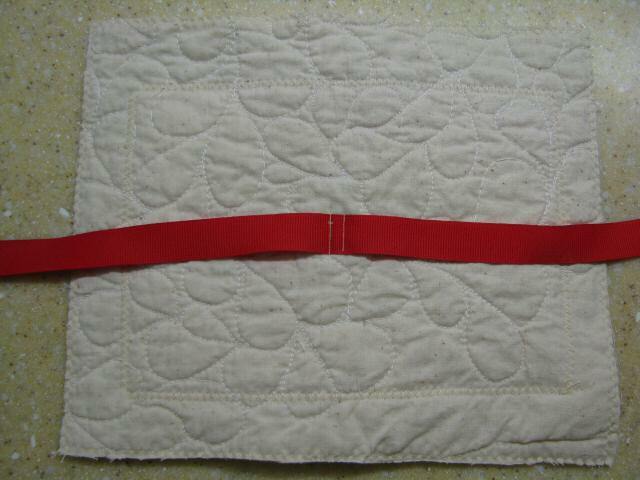 On the latter, I used matching thread to machine stitch down the binding, then went over that with a decorative stitch. Thank you, Barb Brown of Colorado, for taking my class! I love your chicken! The day ended with one of my favorite things at Festival: FRIENDS! This evening was the Dinner@8 artists. Jamie Fingal and Leslie Tucker Jenison curate an exhibit each year for several years now, and I am thrilled to have been both invited to submit pieces and accepted in the exhibit! My orca quilt, seen in earlier blogposts on Festival 2013, was in this year’s Exquisite Moment exhibit. 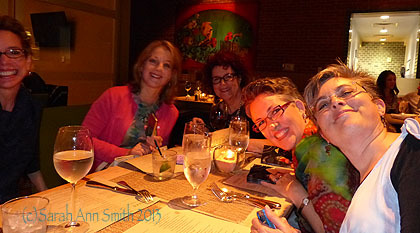 Here a bunch of us who were at Festival enjoy dinner and friendship and art! 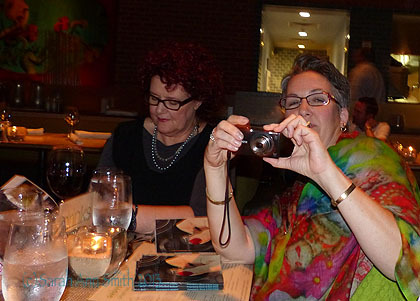 And too much fun not to include, Susan and I taking pictures of each other taking pictures! Now…do I have time to MAKE any before Christmas…what a great gift idea! Thanks so much Janet for sharing with me and, in turn, letting me share with those of you who read my blog! 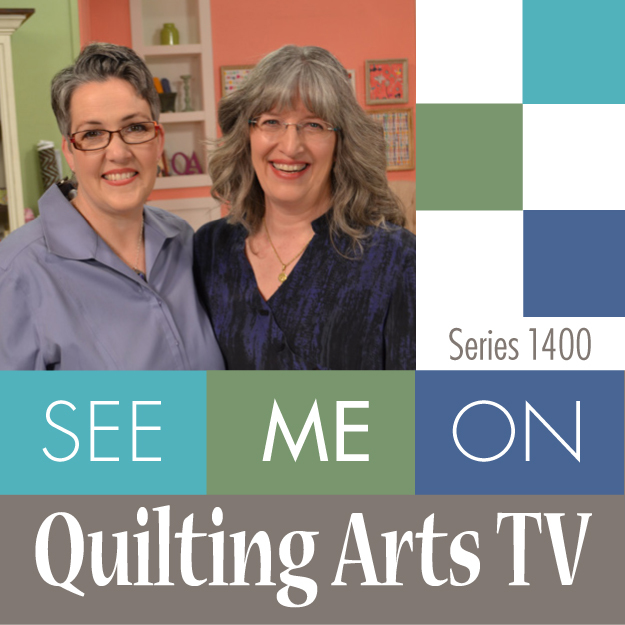 OK…everyone to their sewing machines!